Emmanuel Haldeman-Julius (1889-1951), a socialist reformer and newspaper publisher, began publishing his five-cent, papered-covered “Little Blue Books” series in 1919. Small, inexpensive staple-bound and extremely popular, the Little Blue Books reached both educated and working-class readers. The series included novels, how-to manuals, short essays on politics, philosophy, history, and science, but also covered more controversial topic such as atheism and communism. Haldeman-Julius reprinted works by Voltaire, Paine, T.H. Huxley, Haeckel, Marx and Engels, Ingersoll, Tichenor, McCabe, and many others. The series was part of Haldeman-Julius’s Appeal to Reason publishing company. By 1928, he had published more than 2,000 different titles and sold more than 100,000,000 books. Subtitled a “University in Print,” Haldeman-Julius, a socialist and atheist, wanted his series to bring knowledge, freethought, and literature to the masses. He also promulgated the “conflict thesis” between science and religion. In th 1920s, Haldeman-Julius announced a new partnership with Joseph McCabe, an ex-Catholic priest turned freethinker and atheist. Indeed, McCabe was the most prolific writer for the Little Blue Book series. Haldeman-Julius published McCabe’s The Myth of the Resurrection (1925), The Evolution of Christian Doctrine (1926), The Revolt Against Religion (1926), The Origin of Religion (1926), The Myth of Immortality (1926), The Futility of Belief in God (1926), The Forgery of the Old Testament (1926), Did Jesus Ever Live? (1926), Pagan Christs (1926), Phallic Elements in Religion (1926), The Truth about Galileo and Medieval Science (1926), The Dark Ages (1927), Do We Need Religion? (1927), The Absurdities of Christian Science (1927), Religion’s Failure to Combat Crime (1927), My Twelve Years in a Monastery (1927), The Fraud of Spiritualism (1927), The Psychology of Religion (1927), The Future of Religion (1927), The Church and Modern Progress (1927), and many others. 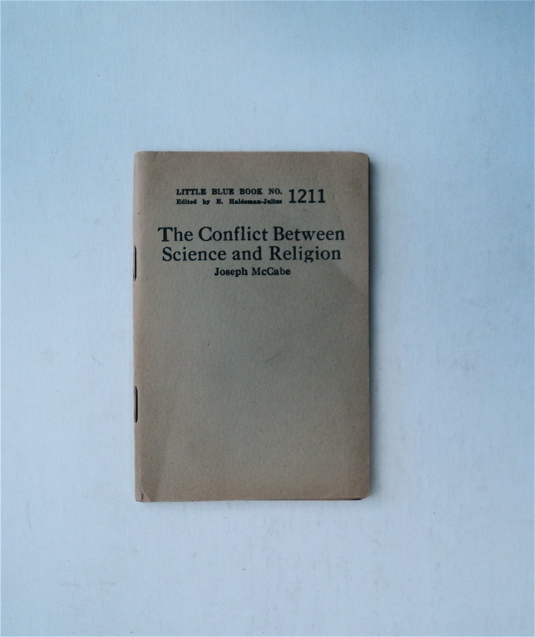 Two of the most important books ever published by Haldeman-Julius was McCabe’s The Conflict between Science and Religion (1927) and The Story of Religious Controversy (1929). In his Conflict between Science and Religion, McCabe repeated the narratives of Draper and White—but unlike them, gleefully cheered on the decay of religion “all over the earth.” In The Story of Religious Controversy, Haldeman-Julius offered an introduction, noting that “if religion is not dead yet, it is dying.” He goes on to say that “it remains but to persist in and complete the work of ridding humanity of this hoary and horrible incubus.” McCabe believed that religion was a series of “wrong inferences.” The scientist is the true savior of humanity. Men of science who are religious, according to McCabe, are plain frauds. There is a necessary conflict between science and religion, and McCabe wanted to show those who denied the conflict were hopelessly ignorant. Emmanuel Haldeman-Julius in America, and the Rationalist Press Association and the “pioneers of Johnson’s court” in England, are examples of the intellectual consequences of Draper and White. It must be emphasized, however, that Draper and White did not want to destroy religion, and thus should not be placed in the same category as the writers of the Rationalist Press Association and the Appeal to Reason publishing companies. If one seeks to unearth the intellectual forebears of the “New Atheists,” they must turn to this later group.